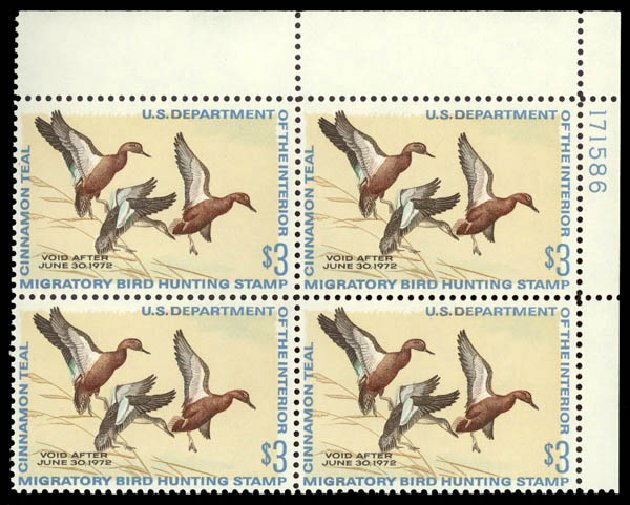 Hunting Permit, 1971, $3 Cinnamon Teals (Scott RW38), top right plate block of 4, o.g., never hinged, pristine mint plate block with bright vivid colors, Very Fine to Extremely Fine. Scott $190. Estimate value $150 – 200. 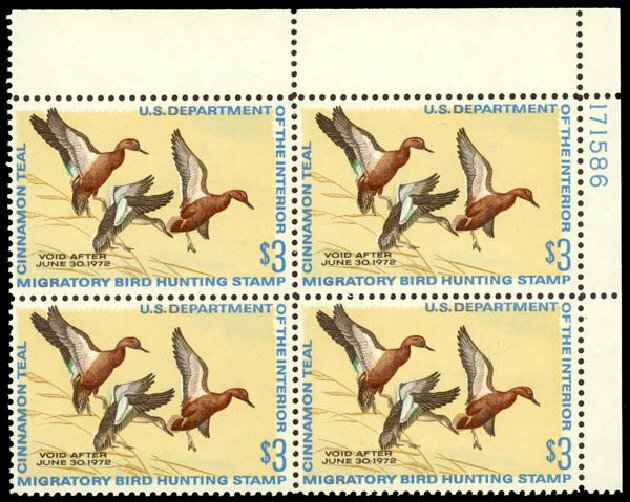 Hunting Permit, 1971, $3 Cinnamon Teals (Scott RW38), top right plate block of 4, o.g., never hinged, extremely fresh and choice, Very Fine. Scott $200. Estimate price $100 – 150. 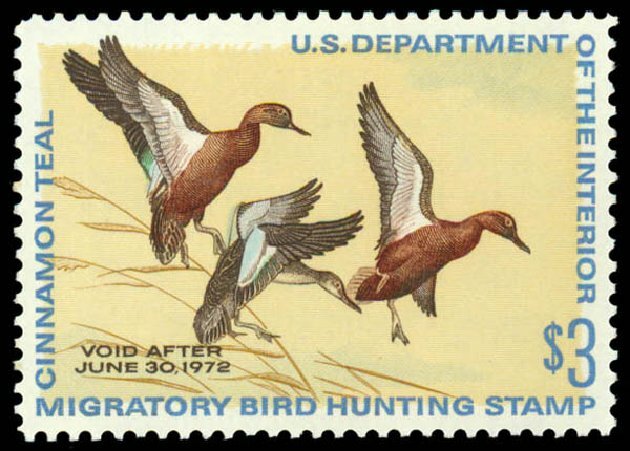 Hunting Permit, 1971, $3 Cinnamon Teals (Scott RW38), o.g., never hinged, an extraordinary top quality stamp in a wonderful state of preservation, Superb, 2005 P.S.E. certificate graded SUP-98 (1 of 81 at this grade, with 20 others grading higher). SMQ $195 in the grade of SUP-98. Scott $45. Estimate price $150 – 200. 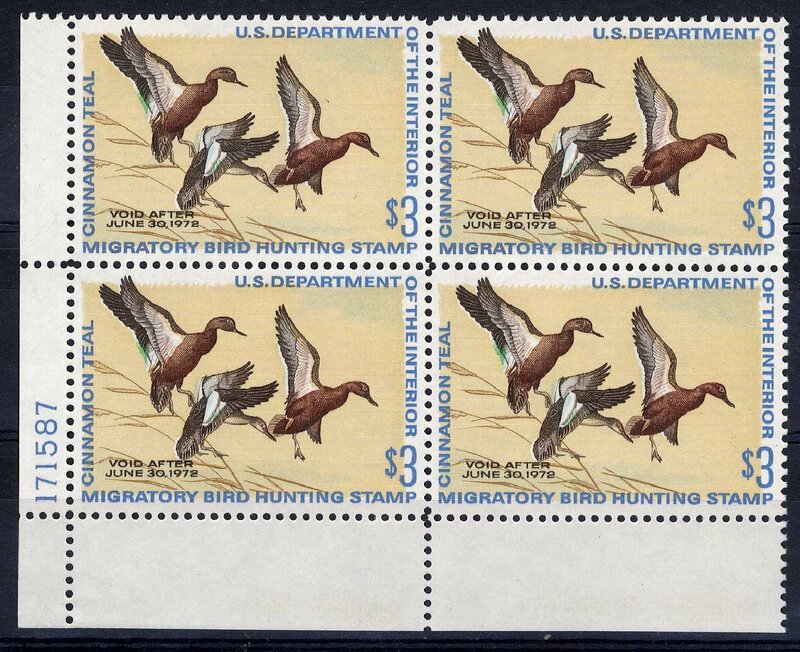 UNITED STATES Duck Hunting 1971 Three Cinnamon Teal, $3 multicolored, bottom left margin plate no. block of four, n.h. and post office fresh, v.f.